Temple Aaron has but a handful of members, and they come from a geographically wide-spread area. The Temple is perfectly maintained as it always has been - mostly because of the upbeat spirit and care of the Rubin family and other congregants who make sure Temple Aaron continues its traditions. The service is Reform only, as the Temple carries on as it was started – Reform. The Rubins invite all nice Jewish people to come to Trinidad and visit - or better yet, join - the congregation. As they have since who remembers when, Temple Aaron will be offering High Holy Day services this year. The community would love to welcome you! Raton and Trinidad to see a presence from Albuquerque. break-fast at the Temple (nominal fee for non-members). Temple Aaron is facing a challenge - and an opportunity. The Rubins recently sent out this letter to Temple Aaron's many congregants and friends. The time is now. We need your help! Opportunities have arisen regarding repairs to our historic building. Areas of need include a deteriorated roof, window seals, and plumbing, among others. Of these, the most pressing is the roof. As many of you may know, the existing roof on the Temple is the original, built in 1889. After endless years of leaks, holes, damage, we have temporarily made repairs, but a permanent solution is critical and must be addressed at this time. As we are applying for grant funding, Temple Aaron must commit to matching funds: our obligation in the $50,000-$60,000 range. With pledges from each person who cares for Temple Aaron and our agreement to ‘spread the word’, we can make this happen! 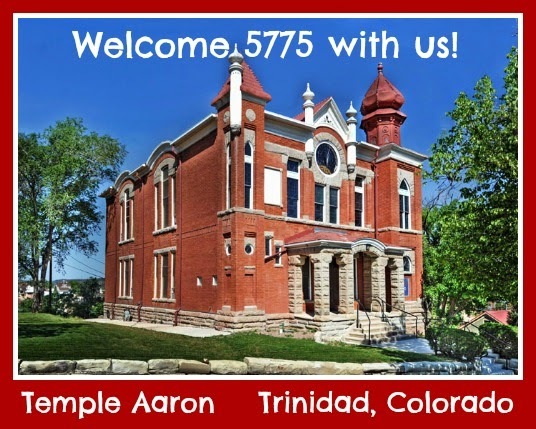 Each person joining our Temple Aaron family becomes connected to our long history and wants it maintained. The congregation has grown as members and many friends have contributed financially to help preserve this historic building, the congregation, and our long history. Numerous visitors come equipped with cameras and questions, finding the perfect lighting, angles, design to depict the beauty and intensity we all feel. Whether a social visit or celebrating a religious holiday, the energy of Temple Aaron shines through. The question becomes how do we keep our little congregation and its historic home alive? What must we all do to continue to grow, to share our commitment to preserving Jewish life in rural Trinidad, Colorado? A fortunate set of circumstances has come to be, with the upcoming state grant and Rural Philanthropy Days conference, offering a chance to seek out available grants this fall. Our own member, Jack Rouff, of Denver, has generously offered his professional services, expertise, perseverance, and time for grant writing. Jack has agreed to participate and apply for funding. This is a hopeful possibility for Temple Aaron. The time is upon us to take action! The past generosity of our members and friends has helped keep Temple Aaron open for over 100 years! The pressing repairs and Temple maintenance make this an emergency situation that requires a much larger financial commitment. If we all look inward and continue our own generosity, as well as seeking help from others outside our immediate community, we can keep our Temple Aaron going for the next 100 years. Your generous pledge or tax-deductible donation will help keep our synagogue ongoing. These pledges and donations must be received before September 29 to meet the grant requirements.